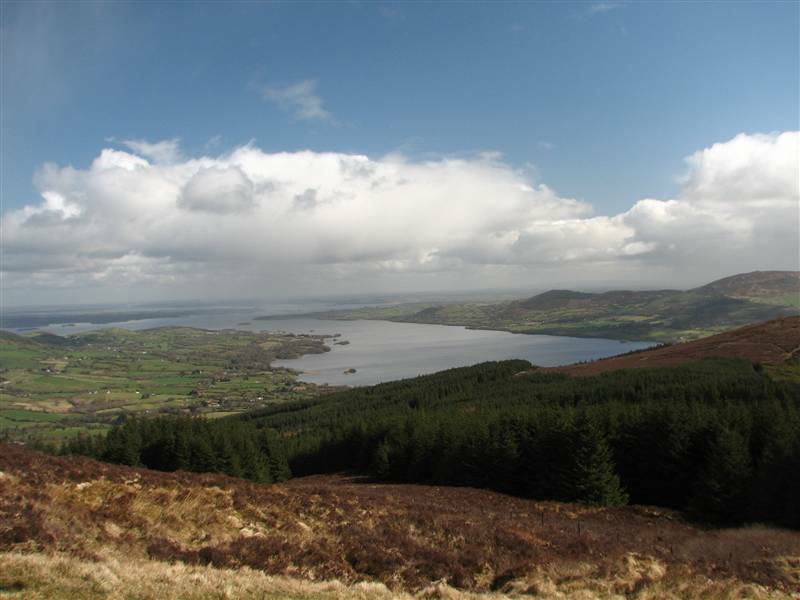 Moylussa (532 meters) is the highest point in Clare, and lies just outside the village of Killaloe, overlooking Lough Derg. I followed the advice of Tony Dotherty who wrote a piece in the Irish Times about climbing the mountain. In a nutshell you park in Ballycuggaran forest park and follow the Crag Wood Walk and the East Clare way before breaking off to tackle some extremely boggy ground which shortly gives way to a gravel track leading to the top. 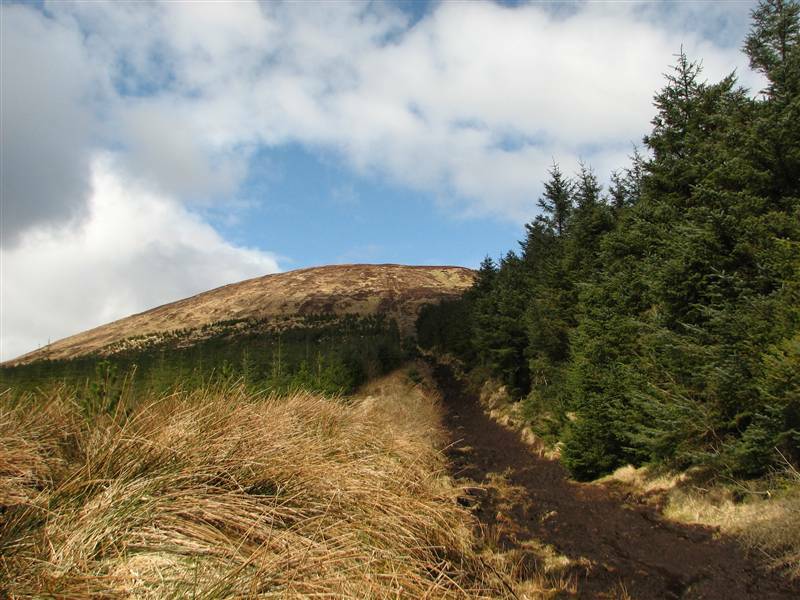 The initial sections of the walk offers ever expanding views of the lough, which is a bonus as the second quarter takes you through standard issue Coillte woods that look just like any other around the country – spruce and pine planted so close you can only see about five feet into the forest. Lough Derg from the Crag Wood Walk, Ballycuggaran Wood. Things get interesting a couple of minutes after you pass an abandoned portacabin and take a right turn into a firebreak of supersaturated bog and grass. At one point the solid-looking ground for about ten feet around me was wobbling like jelly…I had visions of being found with just my fingers sticking out of the bog. 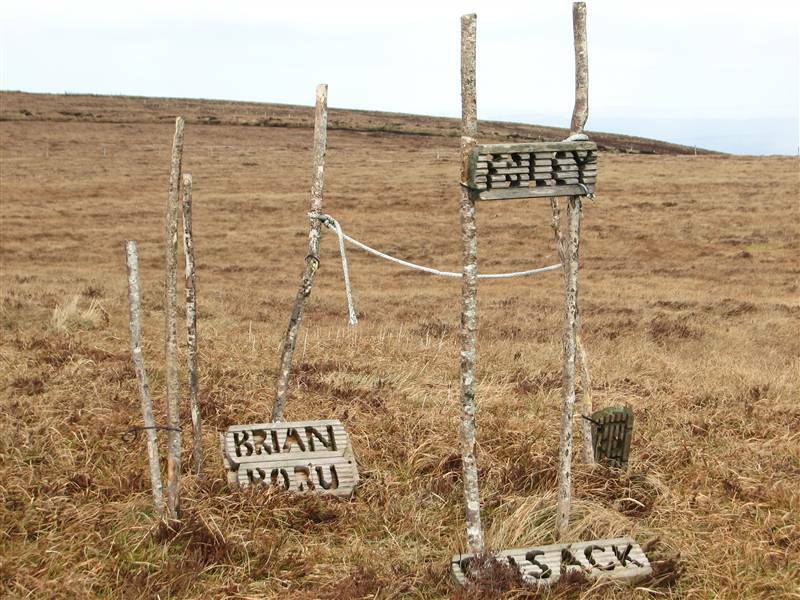 A short passage through the boggy grass leads you to a right turn onto a longish track of boggy bog. I crossed onto the left hand side and walked in the raised grass verge where there’s a slight trail you can follow. After a couple of minutes the boggy bog dries into a stoney path which soon delivers payback in spades when you emerge from the trees and get your first view back down towards the lake. Payback. 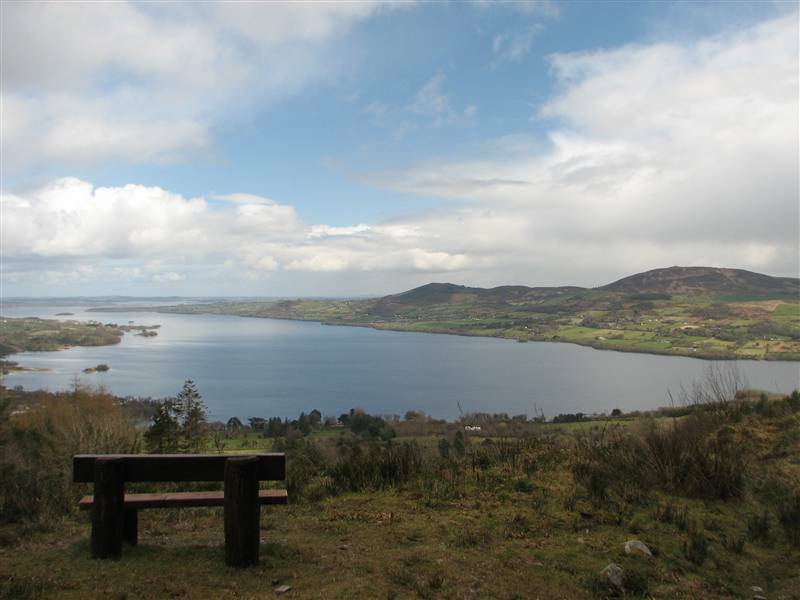 The entire length of Lough Derg on view. 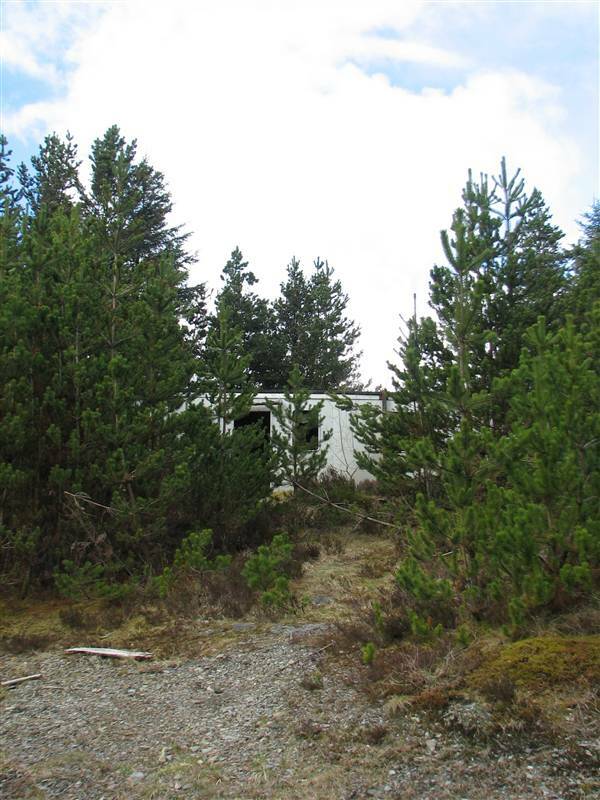 A short spell later will see you on top of the mountain where a welcoming committee off rusting car batteries and corrugated iron have lain in wait for several years. Walk further on and you’ll reach some more odd summit furniture. Door to door this walk took me 2 hours and 45 minutes, including a generous stop for coffee and views enjoyed below the summit while the spring sun made a welcome appearance. Coillte information on the Ballycuggaran forest. A fine route description, similar to the path I took. Finally, the actual route I took, from the Irish Times. This one sounds like a bit of a slog – I don’t like the sound of that super-saturated ground! Aye, give it a few weeks of dry weather…standard Irish summer 🙂 and maybe it’ll dry out a bit. Did it in Jan, heavy frosts. Boggy bog frozen solid ! Aye, a nice bright crisp winter’s day can make for perfect hiking with good solid ground underfoot. I did this yesterday as my final county summit and not only have Coillte put an excellent pathway in place almost to the summit but they have also placed a new summit marker! Fair play! That sounds great Peter, Where is the starting point for the pathway? Hi, significant upgrading of moylussa by coillte. 1-signpost at mountain road indicating gravel path to summit. 3-glorious studded sleeper boardwalk across boggy dome–same transit and fogproof! Hi Conor, sounds great. Must re-visit again soon. Thanks for the update!